“We must cherish every moment, for it is our only true possession.” This idiom and many others can be found in a Buddhist handbook used by nuns at the Fajing Monastery in Hangzhou’s central Westlake District. Last summer, my girlfriend and I were fortunate enough to be shown around the temple by two incredibly welcoming nuns, Wisdom and Insight, who were living and studying there. Buddhism is the largest of five officially sanctioned religions in China, the others being Taoism, Islam, Protestantism and Catholicism. Every year, countless children are sent to study as monks and nuns and begin a journey towards monastic life. Sometimes the parents send their kids, but often the children decide for themselves. Insight told us that at age 14 she felt unsatisfied with what she saw as the materialism of modern Chinese society, and so asked her parents if she could leave regular middle school to study at the local monastery. 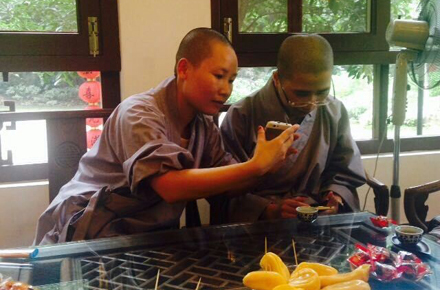 Although her parents are both Buddhists, they never planned for her to take up monastic life. But after seeing how much it meant to her, they reluctantly respected her wishes. Now in her early 20s and a full time student, Wisdom only gets to see her parents for a few days every year. She spends most of her year on the grounds of the Fajing Monastery, her average day beginning at 4am and filled with study, prayer, chanting, meditation, and eating simple vegan food. Many people probably think the nuns live lives of hardship in this quiet green oasis right in the heart of bustling Hangzhou, denying themselves the pleasures of modernity just outside their door. This view is wrong on several counts. Although the nuns undoubtedly exercise a great deal of self-discipline in their daily lives, they appeared to me to be far happier, friendlier and more relaxed than most people I see on the streets of Hangzhou. As some of the nuns explained to me, it is not material possessions that can bring us happiness, but rather the ability to live wisely and compassionately in the present moment. On this I’d say they were succeeding. While we were there we experienced too many instances of hospitality to count, from the nuns treating us to a tea ceremony and fruit upon our arrival, to showing us around the grounds and halls, to chatting and earnestly answering all our questions. Wisdom and Insight even invited us for dinner at a vegan canteen, insisted on paying for the meal, and gave up their own umbrellas for us when we departed in the rain. It would also be wrong to assume that the nuns eschew modern culture. For instance, most carry smartphones, which they use to keep in contact with friends and family and post Buddhist messages on the Chinese social media platform WeChat. Indeed it was WeChat that allowed me to make friends with Wisdom in the first place and arrange our visit. Wisdom and Insight were also both very interested in literature, and wanted us to recommend them some of our favourite English language novels. When we finally left the monastery, the rain had made taxis scarce, and we struggled to negotiate an acceptable price with the driver of an unlicensed black Audi. As we drove home through muddy concrete streets surrounded by high-rise apartments, the driver and I spoke about China’s economy and the price of property in Australia. The ride home may have been a jarring leap back into modern material Hangzhou, yet in my hand I held a copy of the Buddhist handbook as yet another demonstration of the nuns’ generosity. I’m hoping that by reading some each day, I can remember not only that I live in a big country with a huge diversity of worldviews, but also to cherish every moment I have here as well as I can.